On Saturday, we ended up with a lot of extra lentils at FoE. A LOT of extra lentils. So I brought some home, and Danni (with assistance from Jo) made some pie. The lentils were a bit runny, so Jo thickened them up, and then there was some potato cooking to coat the lentils in sweet potatoes and garlic and nutritional yeast. And then the pies went in the oven. And then they were DELICIOUS. This is just one thing that we sometimes do with leftovers (also I put the rest of these leftovers in a very tasty lasagna, but more on that later). I love road trips. We've been getting out and about a bit of late, last weekend we went to Edgar's Mission just outside Kilmore; this coming weekend we're heading over to Ballarat; and this weekend just gone, there was a road trip to Daylesford. WITHOUT ME. Harvest Cafe is a cafe with a large range of vegetarian and vegan options, enjoying the patronage of (seemingly) old ducks, featuring lots of new age art, and is also a grocery store. It was here that our intrepid adventurers had lunch. Jo had the Waiter's Salad. This was mostly comprising of cabbage, and sadly lacking in dressing. The menu mentioned 'Indonesian dressing,' but noone was able to work out what that was. 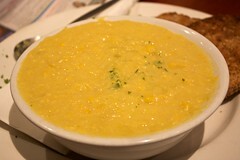 Em ordered the sweet corn soup. This was ample lunch, as Em was both unable to finish it but able to enjoy it immensely. Lunch overall was declared, 'okay, not stellar.' Would go again if in the area. Then, our intrepid adventurers adventured on to Himalaya Bakery, where they ate delicious baked goods. 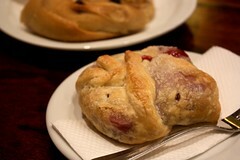 Fortunately for them, they brought me home a cherry danish! 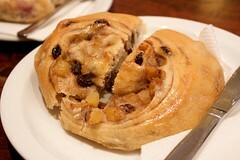 And it was delicious (I love danishes). First Danni picked up a cold, then she passed it on to several people. So we were sitting around the house, and en-colded vegans were feeling a bit gross, so I did what I always do in this situation: I made a curry. I had a little bit of tempeh and a little bit of tofu floating around in the fridge, so I thought I'd use this to make a kapitan. I also had two bulbs of bok choi wilting in the bottom of the fridge, and so it seemed like a good time to make ginger bok choi. I usually use mock chicken for this, as kari kapitan is a chicken recipe, so I wasn't sure how this was going to go. 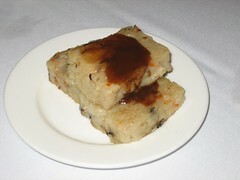 Overall it went okay - the tofu was good, but even though I fried the tempeh for ages, it was still kind of bland. If I was going to try this again, I would probably try and marinate the tempeh in some chilli or something for a little while before hand, and then cook it exactly the same way. It might make for some spicy bites, though, which are all good. 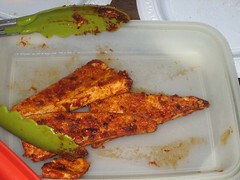 I would recommend marinating the diced tempeh first in some chilli flakes, mixed in a little water to form a thick paste that you can rub into the tempeh. Using a thin-bottom pot, fry the shallot (sliced) in some peanut oil with the garlic, until it starts to discolour. Mix together the chilli and garamasala with a little water until a thick paste is formed, and add this paste, as well as the tempeh, to the pot. Braise the tempeh, and coat well in the paste. Keep frying, and adding more oil, as necessary, until it is well cooked. About halfway through, add the tofu. The tofu doesn't need to be well cooked, but some firming and frying is good. Add the potato, tomato, lime kaffir leaves and curry leaves, as well as the stock. 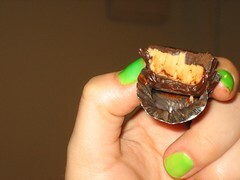 Add extra water so that the ingredients are almost but not totally covered. Simmer on low heat with the lid on for about thirty minutes, then add the snake beans. Add extra water if necessary, and replace the lid. Simmer or another twenty minutes, then add the coconut milk. Leave to simmer with the lid off for ten minutes. Smother rice in the gravy and serve (maybe with some roti). In a little peanut oil in a hot wok, fry the chillis with the ginger, then add the carrots and a dash of water, and put the lid on. 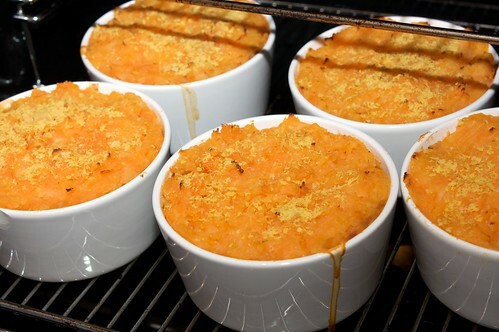 Leave to steam for a minute or three, until the carrot softens slightly. Add the bok choy stalks and a dash more water if necessary, and repeat with the steaming. Then throw in the leaves and the sauce to wilt, and serve. Danni really liked the look of Carla's zucchini fritters, so last week, armed with two zucchinis and a large grater, we gave them a go. 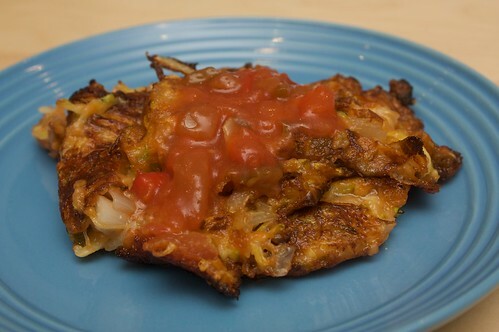 Carla's fritters look more appetizing than ours do, piled high like that, but ours were still very delicious! I had to fry them for ages, six minutes or so for each side (so about ten - twelve minutes per fritter), and you have to make sure you drain them a little (or pat them quickly) before serving. I used salsa instead of chutney, and next time I'd like to add maybe half a grated carrot, and I would have added some cheezly if mine hadn't gone moldy. But, oh, there will be a next time. These were great! I used plain flour for these, but I'd like to try it using besan or a plain gf flour. Mix together everything except the oil. Mix it well! Heat a bit of oil in a fry pan. 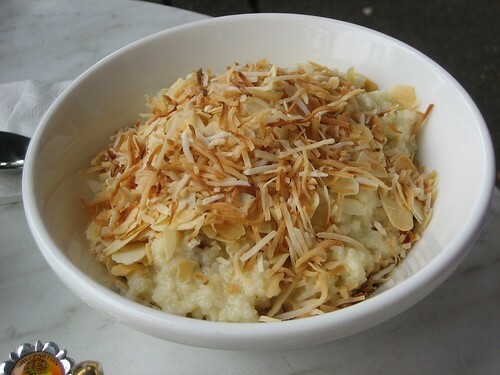 Once it is awesomely hot, scoop out some of the mixture, about a palm's worth, and dollop it in the pan. Flatten a little, and let it fry. Do as many as you feel you can handle in the pan at once. After six or so minutes (or, when it's browning nicely on one side), flip it, and do the same. Drain and serve with some salsa or something. I wonder how this would taste with guacamole. My friends Gen and Esala are in a band called Genevieve and Jezebel (Jezebel is the harp, not Esala), and they are in residency at the Builders Arms (in Fitzroy) on Thursdays in April. So last Thursday Danni and I ventured forth into Fitzroy to see them! You should go and see them! They are playing for one more Thursday as part of their residency, and their list of influences includes: Melbourne, Vegans. We're in Melbourne! We're vegans! And there is a harp! It's only $6! The band room has comfy couches! The band is headlined by a vegan! So incidentally, we also love the Rosie Burgess Trio, a band which is also headlined by a vegan (and whose repertoire includes a song with the line 'and stop eating meat'). We saw them last night (which I will talk about later, with my next restaurant review), and they only have one more show before they tour around North America for three months! Vegans! Music! Things I love! Anyway, before seeing Genevieve and Jezebel we thought we'd go for some (VEGAN) noms at Las Vegan Nirvana, since they are handily open for dinner on Thursday nights, and we'd not yet been. Upon arrival, we managed to snag the last two burger buns. I ordered the lentil burger, and Danni ordered the Thai chicken burger, and between us we shared the big bowl of chips and dips. I love me some hand cut chips. These were good, and I liked the dips (especially the peanut one). 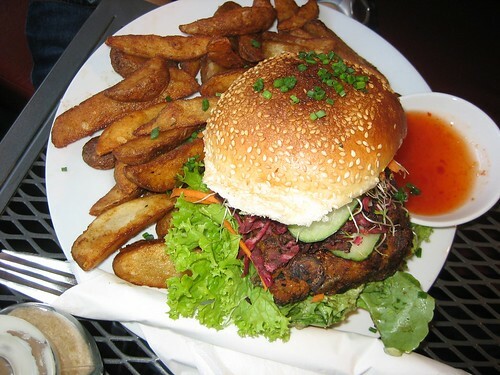 The lentil burger was ooey-gooey oozing out, but good. I liked the flavour of the lentils, though the mayo was not really my thing. Danni reports that the Thai chicken burger was okay - the 'chicken' was identical to the chicken nuggets at Lord of the Fries, and the sauce was good. 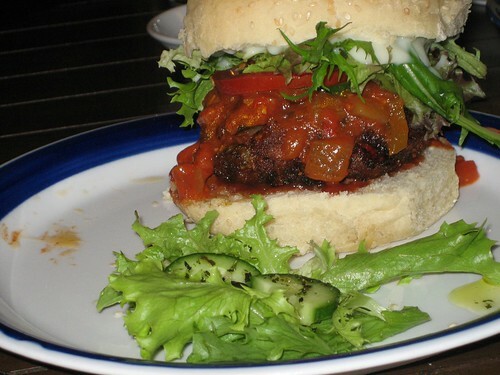 Earlier in the week I guest supplemented/posted at Eurasian Sensation on being vegan in Malaysia, as part of Chris' Eating Vegetarian in Malaysia post. Writing my piece for this was a bit of a challenge - I just spent a lot of time thinking about how I love the food when I go up there, and not so much the practical aspects of being vegan. It's nothing exciting, really - I spend a lot of time in temples and associated restaurants, I get recommendations from family members, I speak a few useful languages and dialects - and these are not necessarily useful pieces of advice to give to people looking to tourist. But oh, how I love the food I eat when I am up there. The endless plates of noodles and the old favourites that I have always loved. My parents are heading up there next week (as part of a cruise - they sleep at night as the ship cruises around SEAsia, and in the morning they wander off the boat and visit whichever friends or family are in the area. I am jealous! ), and all I can think about is the things they eat. I've also got a post up at Vegaroo, on our visit on Sunday to Edgar's Mission for Edgar's 7th birthday. Sadly, after I wrote the post yesterday morning, I discovered that Edgar passed away yesterday. Visiting the Mission made me think quite a lot about our industrial farming complex, and the pressures we place on so many systems. Not like I don't already think about these things a lot! I met some sheep, and some goats, and some cows, and a horse, and some ducks and chickens and pigs. The cows were huge! And so were the pigs! 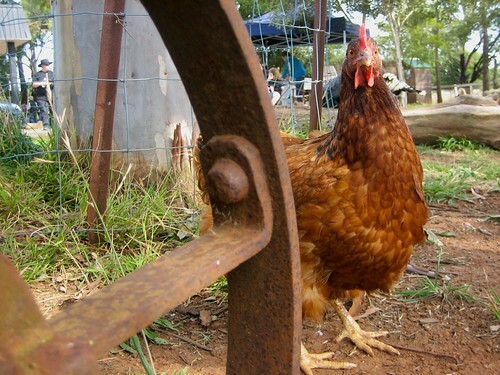 Growing up in the suburbs, I'd never before met many farm animals, so that was exciting. But it's sad to hear how they got there, the dog who was going to be shot because she wasn't efficient enough, the goat who was going to be killed because he was too friendly (and it was becoming dangerous) - but this goat was too friendly because his owners had encouraged it when he was tiny, so we can think of it, really, as a result of human intervention, and not his own fault, that he behaved that way. And we (we as a human whole) should be taking responsibility for that, they way this stuff is, effectively, our fault. My personal refusal to interact with the industrial animal agricultural complex aside, I still think we have a responsibility to them, to treat animals well and not carelessly cast them aside. Anyway, that's where I'm appearing this week! Whilst the weather is still sometimes okay, and not always freezing cold, Em thought it would be fun to have a barbecue. So Saturday afternoon, before heading out to Reservoir for Roller Derby, we ventured around to Em's place for a barbecue. I got the recipe from Carla, who adapted the recipe from Smitten Kitten. I made a handful of tweaks, though the recipe remains largely unchanged, so for my reference (and yours!) you can find it at the end of this post. I also made some sushi (gluten-free), and yet another batch of the greatest vegan sausage rolls ever. I didn't take too many other photos. Toby and Mario spent a lot of time hanging around the barbecue (I OFFERED, and was DENIED), barbecuing things. 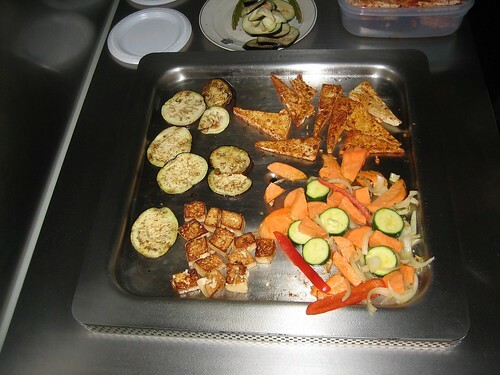 These things included a large variety of vegetables, some eggplant, and three types of awesomely marinated tofu. Not pictured: the salad that Brunswick Jo brought (it was sort of gado gado inspired, with lots of veggies and dried rice noodles), and the sangria that Jo (YOU SEE WHY THERE IS A DISTINCTION?) made. We sadly didn't have time for sweets, as we had to dash for roller derby, so after quickly stuffing our faces with cheezecake we headed off, and at roller derby we had a little sweet food picnic! Kristy had made peanut butter truffles, and Em made chocolate truffles (using leda tim tam things) and lime and coconut cupcakes (all of these desserts were gluten free). I love barbecues. And picnics. It should be thicker than this! Mine is only so thin because my springform pan broke, and I had to use my cheesecake tray. Oh the hardship! So this is the method for if you only have a thin cheesecake tray. To make the crust: mash up the biscuits (I used mortar and pestle), mix together with nuttelex, sugar and salt. Pat into the greased pan, all the way along base and all up the sides, and set aside. To make the filling: Preheat oven to somewhere around 280C. My oven only goes to 250C but can then do fan forced, so that's what I turned it up to. Beat together cream cheese, sugar, flour, lemon zest, egg replacer and vanilla essence. Pour in to pan, and shake around to make smooth if necessary. Drop pan carefully onto counter from a height of five cm or so if you have bubbles (this helps to get rid of them). Put that cheezecake in the oven. You may want to have a drip tray in your oven, everyone else who made this recipe reported drips but I had none. Bake for between eight and twelve minutes, until the top starts to brown a little, and also puffs up just a little. 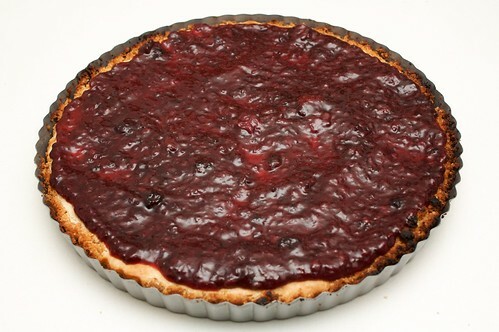 Reduce the heat to about 95C, and bake for another 45 minutes at this reduced temperature. By this time the cake will be pretty firm. Set aside and cool. Refrigerate and let cool completely. 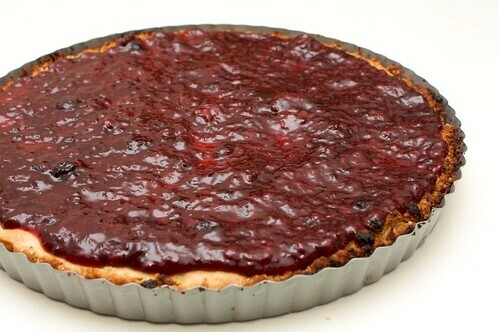 To make the berry topping: bring all remaining ingredients (berries, lemon juice, sugar, cornstarch, water) to a boil, then reduce to a simmer and stir until it reduces. Leave this to cool completely, then pour it over the cheezecake. You can leave it to sit for ages, it will still look and taste awesome! Or you can eat it straight away. Your delicious choice! Something that may result in me spending lots of money has happened. I've discovered that a cafe quite near to my office sells AT LEAST THREE different types of vegan muffin, every week day. 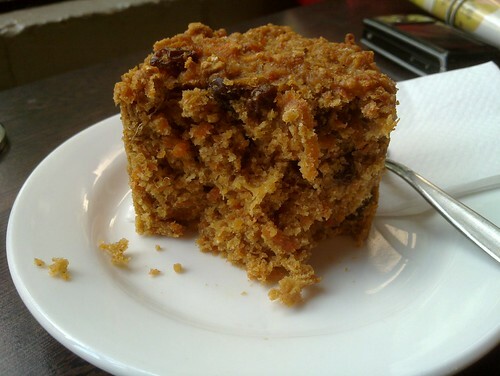 Pictured here is the carrot and sultana, which was light and fluffy and delicious, and due its size, not bad money-wise. There was also a fruit cake sort of thing (that my colleagues keep refering to as a lumberjake cake), and an orange looking thing. I have run out of fruit and lunch is still two hours away. Can I resist the lure? Well, I guess we'll find out. I understand the coffee is not bad, too, if you're in to that sort of thing. So Johanna at Green Gourmet Giraffe blogged about cooking some mee goreng, and I thought longingly of mee goreng, which is my favourite instant food. So fast, so easy, and can be as ridiculous or as fresh and healthy as you want it to be. And then I was writing my vegan contribution to Being Vegetarian in Malaysia at Eurasian Sensation (more on this later), and then I was going out to see a band and needed something quick to eat, and of course it was obvious what I was going to be eating. 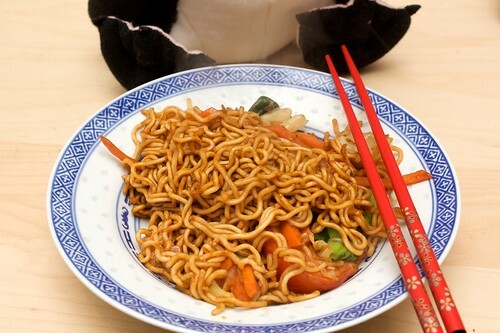 Maggi mee, which I've blogged about previously, is a stir-fried noodle made using Maggi noodles, and the flavouring packet. This is not Maggi mee - it is sort of an odd amalgam of Maggi mee and mee goreng. I don't buy Maggi anymore, because it's owned by Nestle. 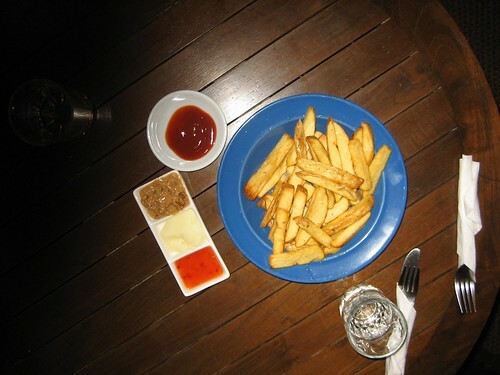 It occurs to me writing this how many of my favourite foods from Malaysia are Nestle-inspired. Milo Ais and Milo Dinosaur are both made using Milo, which is also a Nestle product. Sadface! * (also not vegan, just an FYI for connoisseurs of Malaysian drinks). 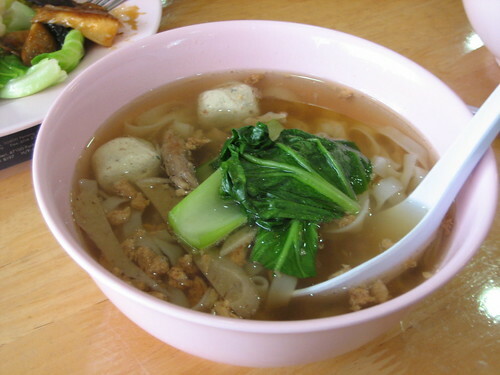 Soak the noodles in hot water until soft, then drain and set aside. In a wok, heat up and add some oil (I use peanut oil for this). Throw in the chillis (sliced, seeded or deseeded as your preference), and the carrot. Fry for a minute, then add a little water and put the lid on, and leave to steam for a few minutes. After it softens, throw in the tomato, , and any other longer cooking vegetables such as snow peas, cabbage, or stems of bok choy. 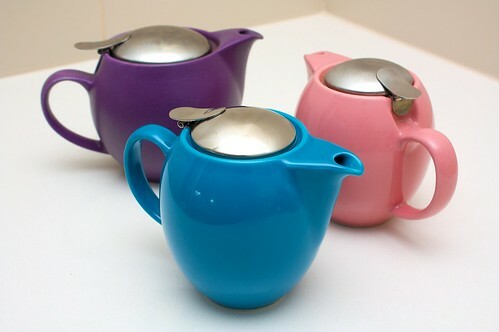 A little extra water, then lid on again to steam. Finally, throw in the noodles, sauces, and any last-minute vegetables. Fry again for a little bit longer, and hooray! 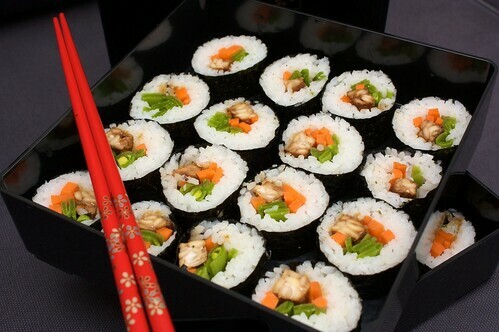 I can get this done and served in about fifteen minutes, if I dawdle. Delicious good times! * I don't use Nestle products, a luxury I am grateful to have. Here is a link to the Wiki article for some brief info if you have no idea what the Nestle Boycott is about. and the list (includes links to info about the boycott). Continuing on the breakfast theme, Danni and Jo went out for lunch and ate breakfast in Camberwell before continuing on for some hard but successful vegan shoe shoppering. Although the menu is sadly absent of vegan items, the chef is very happy to alter things to make up what was by all reports some delicious meals! This avocado and tomato salad on toast is a nice change from a straight avocado on toast, I think! Danni reports that the avocado was really enhanced by a sprinkling of sea salt, and the tomato was nice but a bit solid. 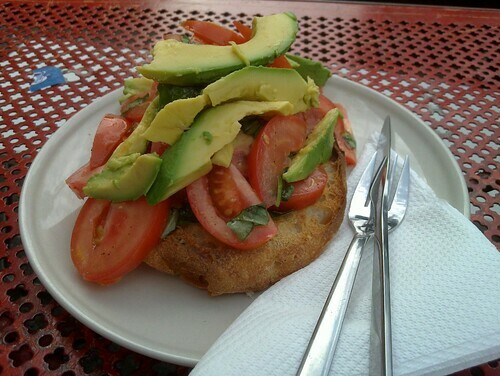 I know we're trying to branch out from the avocado and toast provided by all cafes across Melbourne to us vegans, but still, deliciousness is okay! Cindy and Michael visited it a while ago, you can find their review here. Doesn't seem like they change their menu much (not that that is a bad thing!). I really enjoy making breakfast! 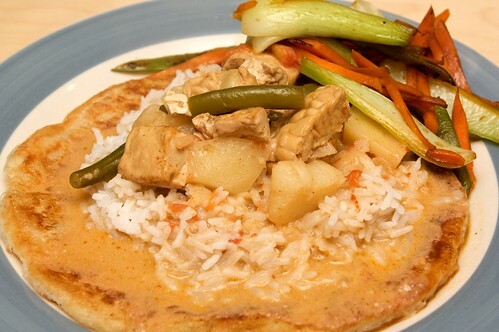 I like eating curry + roti canai, or making some mai fun, or scrambled tofu on toasts. We often have pancakes. We have even been known to have mushrooms and avocado. We recently invited our friends Nix and dB over for breakfast and a spot of tea, as they had been away in England for a few weeks. 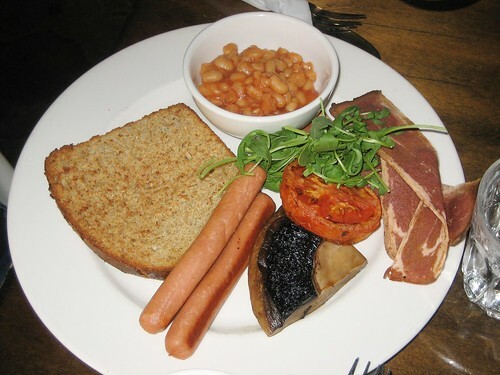 I was worried that serving them something a bit English-breakfasty would be tiring and same-same for them, but I was reassured that breakfast in England only comes in one colour (grey), so anything I served would be very welcome. I love a good scrambled tofu, so I knew I'd be making that. I'd once previously made the cheater's baked beans from Vegan with a Vengeance, and remembered it as tasty, so straight into the oven went those. I remembered Cindy blogging about the hash browns from Vegan Brunch, so I thought I'd give that a go well. Combined with toast, it seemed a well-rounded breakfast! The baked beans, as I had hoped, worked a treat. I kept them in a little long, so they ended up slightly burnt, but they were still very tasty, and I spied several breakfasters eating directly from the baking tray long after they had declared themselves full. 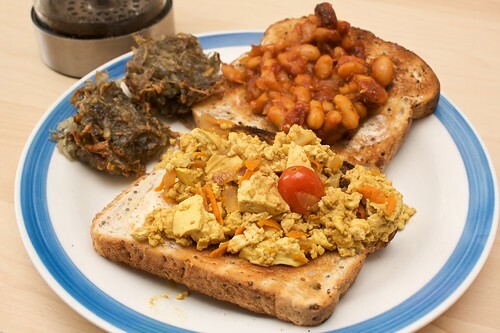 The scrambled tofu was as it always was, ie, delicious (recipe at the end of this post - yes, after many weeks, finally, a recipe!). The hash browns left a bit to be desired. It wasn't that they were bad, they just weren't spectacular. It's also the first time I've tried making hash browns, so I'm still on the search for a good recipe! In a little bit of olive oil, fry the onion and the chillis on medium to high heat. As it starts to soften, add the cherry tomatoes and carrots, and keep frying until the tomatoes start to wilt. Add the tofu, and break it up to your preference (I prefer it to be completely broken up, but some people prefer to keep it in chunks). Add in the remaining ingredients, and leave to simmer for five to ten minutes. You may want to add more soy sauce (I often do). Hooray! That's it! Serve and nom. Last post about the long weekend! And what a tasty one it is, too. On Tuesday morning we ventured across to Grigons and Orr in North Melbourne. I've eaten at Grigon's and Orr a couple of times, and was delighted to find that the menu has extended to include a few more vegan options than previously. I went for the tofu scramble. 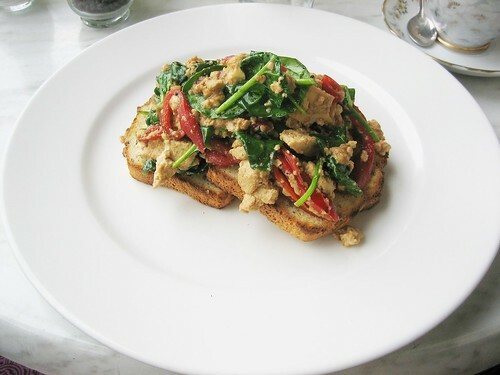 This scramble contained roasted red capsicum, with spinach and I think some pesto, on gluten free toast. It was light, but just filling enough, and was quite tasty. I liked it! Would nom again. Danni went for the cous cous porridge. It was a bit drier than last time we ate it, and the serving size appears to have been reduced to a manageable size (this is not a bad thing - it was so huge I couldn't finish it previously!). Still, the goji berries added something lovely, and I would eat this one again also. 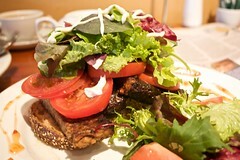 Christine ordered the vegie stack and a side of toast. This was a massive effort on her part! 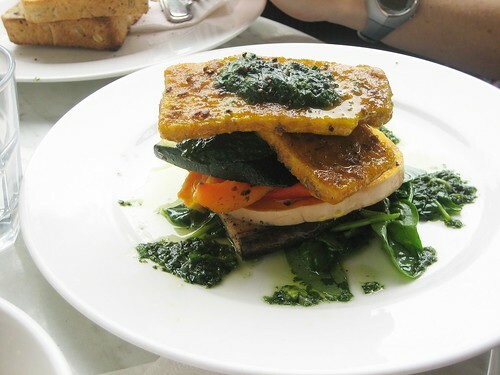 The vegie stack was topped with the marinated tofu that features elsewhere on the menu, and was piled high with some delicious vegetables. Reports are that this was good! 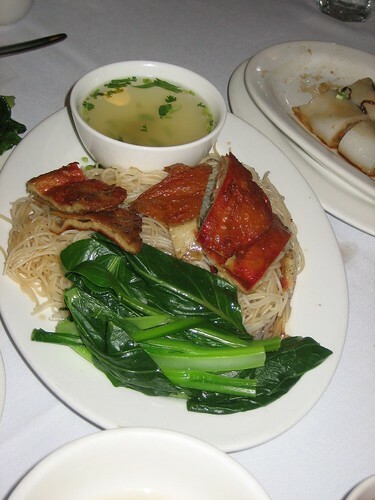 Please note that this is not menu-vegan, you need to specify this to be vegan. We did two pub meals last weekend (I'm almost finished blogging these meals, honestly!). The first was Monday night, at the EBC. 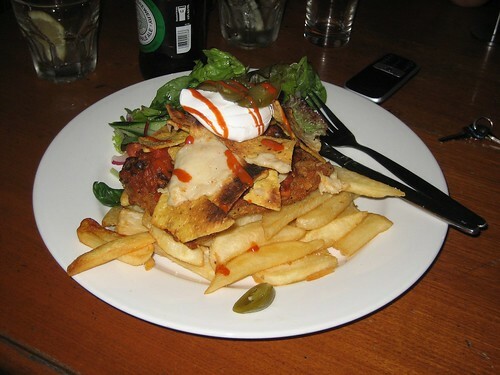 We've visited the EBC many times in the past, and usually I'd go for the vegan parma but I was drifted in to nacho territory. It was really good. Danni and Jo shared the nacho parma, which is exactly what it sounds - a vegan parma, covered in corn chips, vegan chilli, vegan sour cream + cheese and some guacamole. It was amazing! I am totally trying this some time. I can't believe it's been on the menu all this time and I've never noticed it! It's like two of the greatest meals ever combined into one! Las Vegan was still closed for the break on Tuesday, so we headed up to Grumpy's Green, to which none of us had ever been. I've heard many mixed things about Grumpy's! It was quiet on Tuesday, so the service was pretty prompt. Christine and I both ordered the Tower Burger. The patty was nice, and the serving was fine, but without the pesto and mayonnaise (I take the absence to mean the pesto and mayonnaise are not vegan) it was a little bit bland. Danni ordered the Summer Wrap. The avocado really set this off, it was not exciting but it wasn't bad. Again with the missing mayonnaise and pesto. Is it that hard to get vegan versions of this stuff in a vegetarian pub? Really? At least the chips were crinkle cut. Everyone knows that makes them tastier. What was excellent, though, was the infused vodka - Christine was quite taken by the coffee infused vodka. We ended up at the Empire Cafe for breakfast on the recommendation of a Perth friend of Christine's. At first we were a bit concerned, as the menu didn't look super vegan-friendly, but Danni and I had this feeling that Pip has spoken well of it in the past, and there was a little note at the bottom of the menu saying they were happy to cater for dietary requirements, so we persevered. And indeed, they were very happy to cater for us! 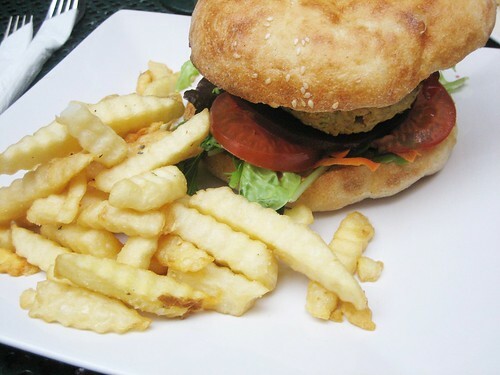 Even though it was breakfast time, Christine went for the veggie burger. This was massive and looked delicious, and Christine said it was good! I would love to drop by and try this for lunch one day. Danni and I both had variations of stuff on toast. Danni went for a mushrooms on toast, and I went for mushrooms and tomatoes with hashbrowns on toast. I love a good hashbrown, and these ones were vegan! Hooray! 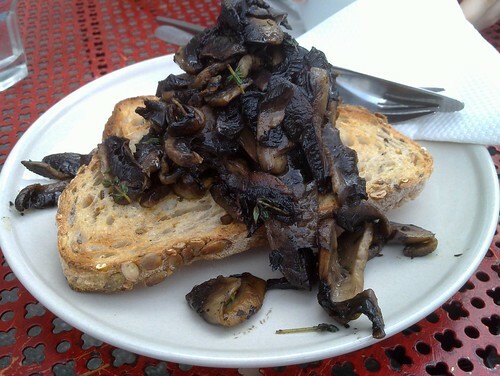 Mushrooms were flavoursome but a bit dry, but overall the breakfast was cheap and good. I think there were GF options on the menu, but not extensive. Sunday night we decided to try fine dining at Shakahari. I know it was a long weekend, but I was super disappointed to discover that the dessert we all coveted (the rice pudding) was unavailable! Particularly given this was only one of two possible vegan dessert options, this was unexpected and not welcome! At least there were cocktails to be had. And main meals, too. Christine ordered the pot pie, which was only lukewarm! Delicious, but lukewarm. Danni ordered the Memory of Medina, which as always was perfectly serviceable. 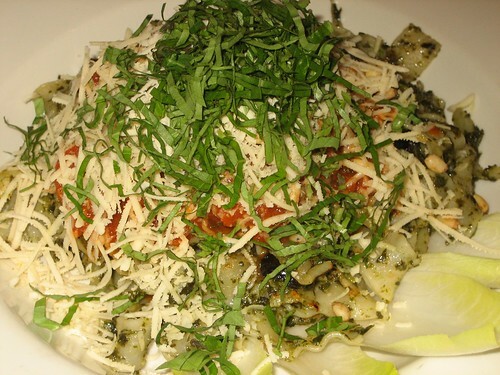 I tried the pasta, which I had never before done. 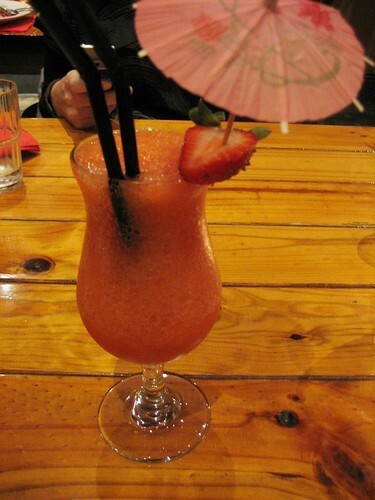 It was tasty! The meal was overall fine, but nothing special. It was the middle of a four day weekend though, so I suppose we can forgive them. Sunday morning we rolled out and onto the train and meandered our way down to the Vegie Hut in Box Hill. 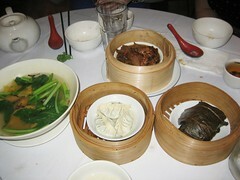 The last attempt at yum cha wasn't super successful, because as it turns out they scale it down during CNY! 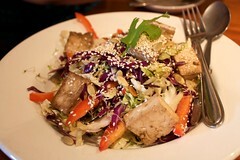 Whatever, Vegie Hut! Didn't take photos of everything, because when you've seen one bao you've seen them all. We ordered cha siu bao, mock duck noodles (with maifun), a wonton soup, radish cakes, gailan, sticky rice, grilled dumplings, spinach dumplings, crispy tofu skin, and mock beef ribs in black bean sauce. 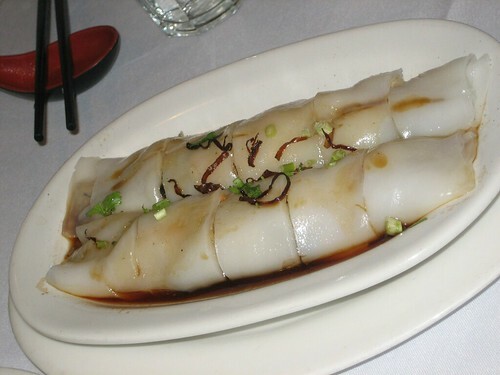 But best of all was the chee cheong fun, which isn't on the menu, but is available anyway! HOORAY. Chee cheong fun is my favourite favourite of all, it is deliciousness and I am happy to know that we can get it if we ask for it! Hooray! Saturday night saw us back at Plush Pizza, introducing Christine to the greatest vegan pizza that Melbourne has to offer. 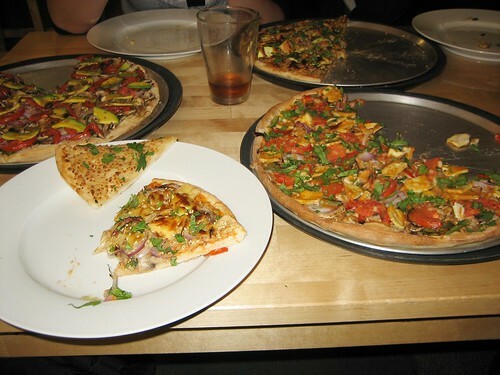 We went for the satay pizza, the tom yum pizza, the ben special, and a garlic pizza. OH YEAH. This was, however, a little bit too much food for us - three larges and a medium between four people (Jo came too), as it turns out, is too much to eat in one sitting. But we took it home, so that's okay! Previous visits: one, two, three, four. Our super awesome friend Christine came to visit us over the Easter long weekend. Danni and I really want Christine to move to Melbourne, so phase one of convincing her to move here was showcasing the very best of Melbourne's vegan noms. We started this by walking over to Ceres on Saturday morning, only to discover it was closed! Disastuh! So instead we took the 96 down to Fitzroy, and decided to give the Vegie Bar a go. Now, I know many veg*ns do not like the Vegie Bar, but lately I have been warming to it, after an amazing lasagna and a quite good soup. 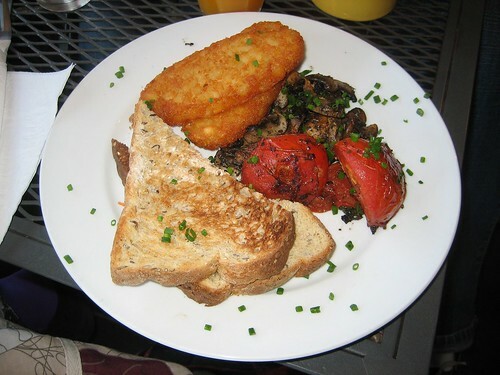 And it turns out that Vegie Bar has a separate breakfast menu, which I didn't realise. 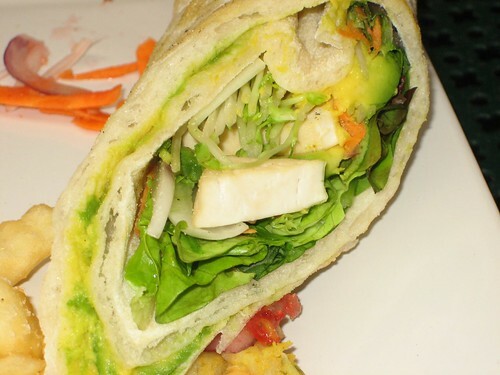 There aren't a huge amount of vegan options, but there are enough. 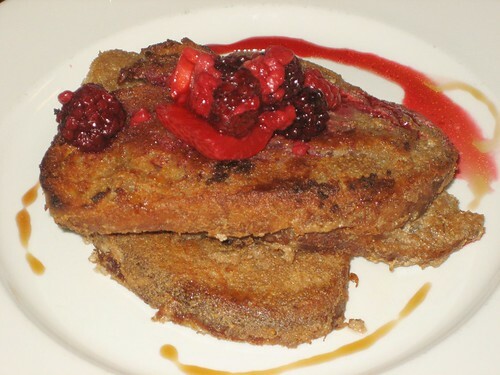 I went for the vegan french toast. This was good. It's a bit thick and heavy, so it's more pancake than toast in texture, but the flavour was interesting and just the right amount of cinnamon, and it didn't feel like it was lacking anything. I would eat this again. Danni ordered the scrambled tofu with roti. This is on the menu with egg! 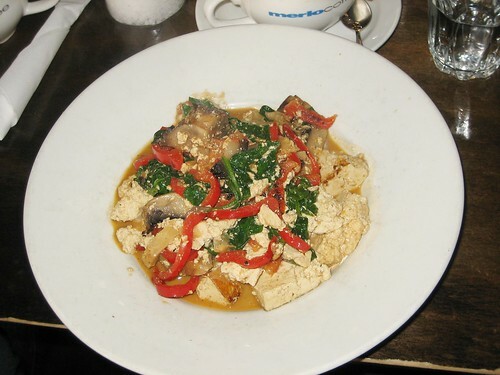 When Danni asked if it could be made without egg, the waitress thought that the egg was an integral ingredient - fortunately it was not, and Danni got to have scrambled tofu, but why are so many restaurants so obsessed with egg? This is, I know, one of the things that bothers many vegans about the vegie bar - that they don't seem as vegan friendly as they could be! ANYWAY, this scrambled tofu was okay, but nothing exciting, and Danni coveted my french toast. Christine ordered the vegie brekkie sans egg. It was okay, reports Christine, but she did worry afterwards about the vegan-ness of the mock bacon and mock sausage. We've actually got plans to go to Plush Pizza tomorrow night for dinner, so I thought I'd better blog this before I get too far behind. Continuing in our campaign to try every pizza on the plush menu, our last visit featured the Aztec (mozzarella, a mild chilli mix containing mixed beans, red onion and capsicum, sliced roma tomato and a sprinkle of cheddar. 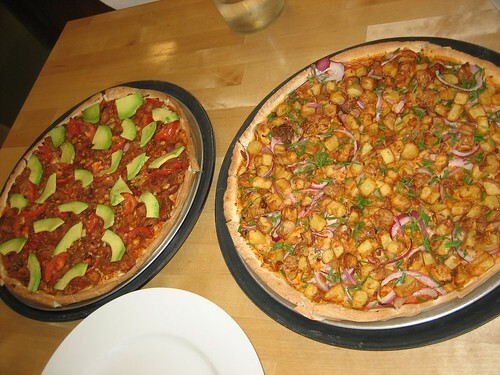 Garnished with and slices of fresh avocado) and the Potato Swoon, which tasted like eating potato gems on a pizza (something to which I am not adverse...). The Aztec was very delicious. I'm finding that I'm really enjoying pizzas with mushy, heavy, saucy toppings. This had a little tiny bit of spice, and the avocado went on afterwards, giving a cold contrast to the spicy beans. Really good! Definitely a competitor for the top pizza. The potato was good as well, I hadn't envisaged something like potato gems (rather than potato slices), so that was cool. Previous visits: one, two, three.